To Departmentalize or Not–Both Sides Weigh in. 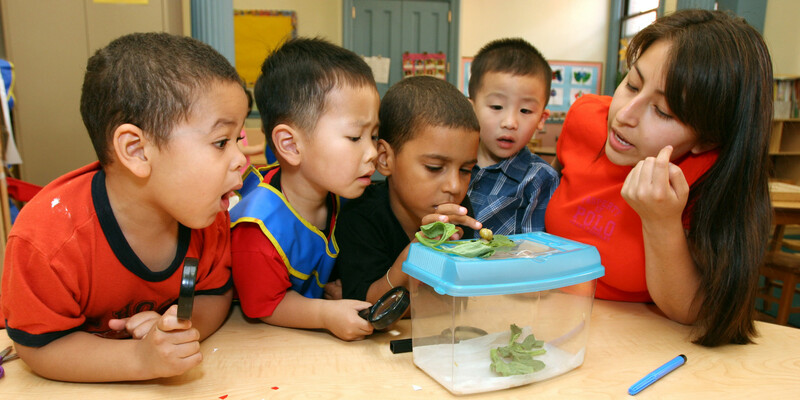 Children examine a snail with teacher . My principal says we have to departmentalize in kinder this year. One teacher will teach math and science and the other will teach reading and social studies. The students will rotate between us. Has anybody ever heard of doing this in kinder? Only a handful have been in school before. I can see this coming. In my district, admin is encouraging switching kinder classes for reading and math since we teach those subjects in small groups each day. What the heck is this? We are so losing sight of this still being kindergarten! They are babies, needing nurturing, time, developmentally appropriate practices! Ugh makes me sad to be a kindergarten teacher sometimes!! I don’t like it. I just retired after 40 years of teaching, the last 20 in kindergarten and I would not like it. My kids had a PE teacher and a Music teacher so they saw other people. We have switched classes for specific skills for 20-30 minutes. The kids did beautifully, and we’re fine with it. We have three K classes and the kiddos know they have a teacher, but many other teachers who are here to help them succeed. Ed. Techs come in during this time to help with small group instruction. We are moving toward being a non-graded district. Kids move through the curriculum at their pace, so teachers will teach levels not specific grades per se. Not sure how it will work, but this is what people have been speculating of this happening. What in the world?????? I can’t even! This breaks my heart!!!!! What is s/he thinking. Obviously doesn’t know how to educate young children. I would cry. Yes!! It works out great! The students were even were in mixed groups between the classes. The children loved it because they got to make new friends! However, we didn’t begin departmentalizing until the beginning of November. When there were three K teachers, we did switch once a week for social studies, science, and art. (Which was just twice a week that my children were out of my room.) I liked that because I was more intentional with my subject, and knew they were getting intentional lessons in the others. We did everything else on our own. I liked it THAT way, but would not want to switch any more than that! I do not think this is developmentally appropriate. We have done it once a week with great success. Once a week! I recommend beginning after recess or ending before recess to eliminate one transition. Why must we always rush young children? Good luck in the accountability department. They can’t handle those transitions. It disrupts their feeling of security and ownership of their environment. I would refuse based on DAP. We do it now in my building. I teach math, science and SS. My coworker teaches LA. The students love it and it really gives us a chance to teach our subjects with passion and not in a rush to get it all in. My daughter loved having 2 teachers and our scores last year were the best they’ve been for K in a while! We had Power half hour last year. We levels students in ability groups to focus on reading skills. It was different, but I really liked it. The kids got to know all four of us and we saw a big jump in abilities. The groups were fluid. We are a Spanish Immersion school and do this daily!!! It’s really hard, and busy, but can work well. Just because you can do it, doesn’t make it developmentally appropriate. I think I would like that!!! This year where I teach we will have three k teachers. Each teacher will teach reading and math. We will be able to group the children by ability and teach to their needs. Following this, each teacher will teach a subject, science social studies and religion. The children will do this like a specials schedule (once a week,) then on Friday we will have fun Friday where they will rotate through stations focusing on the theme of the three subjects. We are very excited to work with the children this way and have the ability to talk to other co-teachers about the children!! NO! Quit messing with Kinder! Seriously, administrators! We got this. Uggg! That does not sound like a good model for Kindergarten. Our school did this in 3rd grade for two years and stopped. Some kids at that age had a hard time with it. The research they sent the parents said that it wasn’t found to be effective for kids that young. I would think it would be a disaster for kindergarten. One exception might be if the teachers rotated through the classes rather than the kids getting up and moving. My friend who went to school in Japan said that is how they were taught. The only reason they are doing this is because they realize that are asking too much of teachers to teach all subjects to integrity and it would provide fewer preps per teacher. We now do this grades 4-6th but I still feel that using a middle school model for elementary is not developmentally appropriate. We did it for 2 years and I enjoyed it. I did it too, with Amanda, and thoroughly enjoyed it as well. I didn’t feel as burned out because I had the opportunity to truly create lessons that made an impact. It helped too, that my partner teacher and I were very much on the same page. I’ll be happy to answer questions too. I taught ELA/S.S. We did it last year! I loved it!! I have departmentalized/ability grouped for the past 3 years in kindergarten and LOVE it! First, it is so good for the kids, because we can teach to differing levels. Second, it helps with discipline because you only have the group for 3 hours before they switch to a new teacher/personality. Third, it helps with parent communication because there are two teachers to inform parents of how their child is doing. We did it the last 4 years and we loved it. As a teacher, it allows you to focus on 2 subjects and become a master of them rather than all 5. The down side is the schedule. You can’t go over your time limitations, and it’s difficult to pull students for extra one on one interventions if they are in the other class. This is the first year we are self contained and I’m looking forward to squeezing in extra interventions whenever I can. Most of our kids adjusted well and it gave them an opportunity to have a change of scenery. Our rules and consequences were the same and parent conferences were nice because you have another person to back you up. Good luck! We did it for 5 years. It worked really well until we went to a reading and writing workshop curriculum. We found that we lost too much time, and the burden on the reading/writing teacher was too great. We are back to self contained this year. I did it with our K crew for part of the year. I absolutely hated it. I wanted to be responsible for what my children were being taught. I bowed out but the other 2 teachers continued to rotate. I do not feel it is age appropriate. interesting. My school is considering departmentalizing next year for our kinder kids. 1 teacher on my team (of 8) is very much for it. She is new to our team. The rest of us are hesitant because it doesn’t seem to be dev. appropriate as mentioned in several other posts. We teach readers and writers workshop (Lucy C.) and I agree that the minutes needed to do this just won’t line up. Unfortunately, I think the writing is on the wall and we are not going to have much of a choice for next year. I need to find ‘concrete evidence’ supporting the pros and the cons so that I can have a leg to stand on. suggestions??? Thanks for your comment. I copied and pasted it back onto Miss Bindergarten’s facebook page so check there for ideas and responses too.